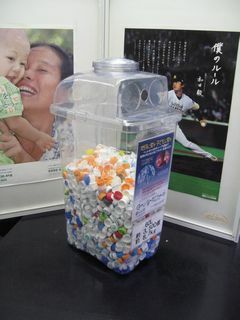 The Ecocap Movement, a Japanese nonprofit organization (NPO) in Yokohama, Kanagawa Prefecture, established in 2007, has been engaged in the donation of polio vaccines to children in developing countries through the collection and sale of plastic bottle caps to recycling companies. Schools, local governments and companies collect caps and bring them to community organizations specified by the NPO. When Ecocap receives a certain amount of caps, the caps are sold to recycling companies. The profits are then donated to Japan Committee Vaccines for the World's Children (JCV) to buy vaccines. Every 800 caps pay for one vaccination, which costs 20 yen (about U.S.$0.20). Currently in Japan, a large amount of polyethylene terephthalate (PET) bottles are used. However, caps are made from plastics with different hardness, allowing them to attach firmly to the bottles. Because materials for caps are different from the PET bottles, they cannot be recycled together. When caps are mixed with other garbage, they release carbon dioxide during combustion, and soil contamination after burial. By collecting caps separately and recycling them, they can be reused in concrete panels, ballpoint pens and chopsticks. As of March 30, 2009, the NPO has collected about 396 million caps. As this activity is based on the general themes of the environment, resources and welfare, many people can easily participate, from children to the elderly, at a grass-roots level. This activity is expected to spread throughout Japan.